The Federal Aviation Administration is warning real estate agents who fly their own drones to take pictures or videos of listings that they are not engaged in a “hobby or recreation,” meaning that the FAA could attempt to take enforcement actions against them if they and their aircraft have not been certified as experimental or commercial operators. The FAA Modernization and Reform Act of 2012 established a “special rule for model aircraft” that weigh 55 pounds or less that are flown by hobbyists within a line of sight from the operator. In passing the law, Congress barred the FAA from adopting additional rules or regulations for aircraft meeting the criteria spelled out in the “special rule,” which also require that model aircraft operators notify airports before flying within 5 miles of a runway. The notice, which took effect when it was issued Monday, restated the FAA’s existing position that even hobbyists are subject to enforcement actions if they fly model aircraft in a way that interferes with other aircraft, or poses a risk to people and property on the ground. Some drone pilots have been operating under the mistaken assumption that the FAA had lost its authority to regulate commercial drone flights. The extent of that authority remains in dispute. In March, National Transportation Safety Board Administrative Law Judge Patrick Geraghty dismissed the FAA’s case against the only person it has attempted to fine for drone use so far. Geraghty ruled that FAA policy notices governing commercial operation of drones were not produced through a formal rule-making process. But the FAA immediately appealed the ruling, which it said had the effect of staying Geraghty’s decision as it undertakes a formal rule-making process to develop rules that will govern commercial drone operators. Until those rules are finalized, it remains unclear whether the FAA will be able to collect fines or levy other penalties against commercial drone operators, although the FAA has made clear that it believes it can. The FAA has issued a bulletin warning that it is a “myth” that unmanned aircraft can be flown for commercial or business purposes as long as the aircraft is small and flown below 400 feet over private property. 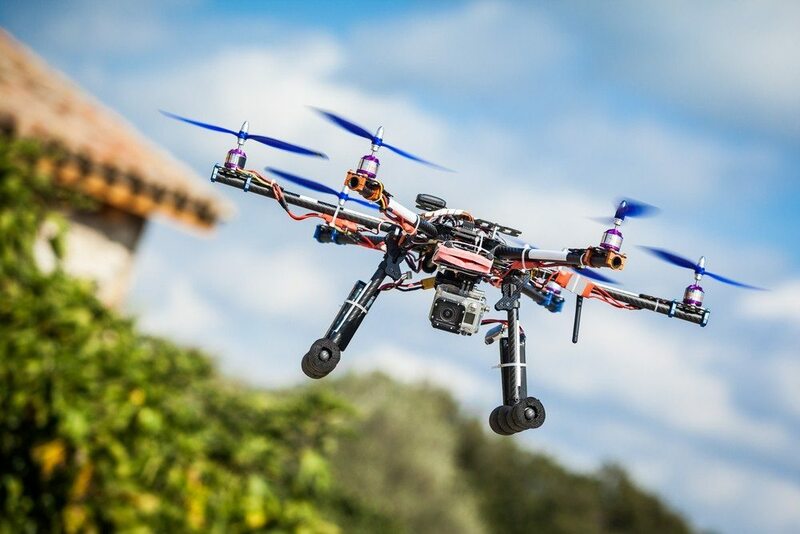 All unmanned aircraft used for commercial or business purposes “are subject to FAA regulation. At a minimum, any such flights require a certified aircraft and a certificated pilot,” the bulletin said, and flights conducted for commercial and business purposes are not exempt under the special rule for model aircraft. 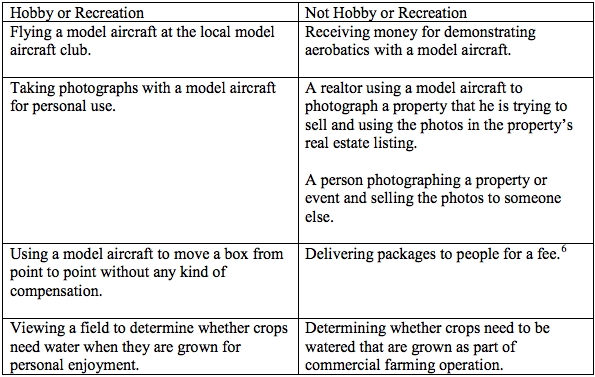 The new interpretation of the special rule for model aircraft makes clear the FAA’s position that many uses of drones in real estate do not qualify as hobby or recreational use, and are subject to current and future rules. “Model aircraft that do not meet these statutory requirements [spelled out in “special rule for model aircraft”] are nonetheless unmanned aircraft, and as such, are subject to all existing FAA regulations, as well as future rule-making action, and the FAA intends to apply its regulations to such unmanned aircraft,” the FAA said in its latest interpretation of the special rule. The FAA has sent out a number of cease-and-desist letters to people and companies it believes are operating drones commercially, which have been posted on dronelawjournal.com. In some cases, the FAA has advised that non-hobbyists must obtain an experimental aircraft certificate or, in the case of public entities, a certificate of authorization. This month, the FAA authorized the first commercial drone flights over land, granting approval for an AeroVironment Puma AE to fly pipeline surveys for BP in Alaska. In April, the National Association of Realtors and nearly three dozen other groups sent a a letter to the FAA urging the agency to speed up its process for issuing rules that will govern the commercial use of drones. Brian Tercero of Keller Williams Realty used a DJI Phantom drone fitted with a GoPro Hero 3 camera to shoot this video of an 800-acre Santa Fe, New Mexico, ranch that’s on the market for $1.15 million. Sergio Gonzalez, owner of real estate marketing firm 3Sixty Strategies, pilots drones over houses, golf courses and lakes to capture aerial footage for listing and community video tours. “Until they officially rule it out and it’s against the law per se, we’re going to continue doing what we do,” Gonzalez said. “Until they’re enforced, you know, I guess I don’t think they’re necessarily valid,” he said about the FAA’s rules. Drone evangelist Matt Murphy said he’s not surprised the FAA wagged a finger at agents who use drones to shoot video and photos of properties. “It’s one of the areas that presents the biggest risks of people buying [drones] and using it right out of the box without knowing how to do it,” said Murphy, who owns Boston Virtual Imaging. Murphy supports restricting the use of unmanned aircraft. “I think they have a huge challenge on their hands and they have really legitimate concerns,” he said. The FAA must “go through the rule-making process and put in place clear federal regulations” before it can restrict drone use, he said. Matt Murphy, founder and president of Boston Virtual Imaging, demonstrated drones in January at the Real Estate Connect conference in New York City. Murphy will be back at Real Estate Connect San Francisco, which takes place July 16-18, where he’ll participate in a hands-on “flight school” panel discussion. Editor’s note: This story has been corrected to recognize the fact that while the FAA may take enforcement actions against commercial drone operators, its ability to collect any fines against them remains in dispute. The story has also been updated with comments from NAR and drone pilots, and to provide links to cease-and desist letters the FAA has sent to drone operators; to an FAA bulletin on “myths” surrounding its authority to regulate unmanned aircraft; and to a press release issued by the FAA this month when it certified the first commercial drone flights over land.